Kennyz wrote: I have found there to be an inverse relationship between creativity and tastiness at Glenn's. Stick to simply prepared fish in simple or no sauce, and you get a consistently good (never great, imo) meal at an excellent value. I think I have made almost this exact statement to people in the past! Stick the the simple sounding fish dishes and you won't be disappointed. If a dish seems kind of ambitious, pass. I will say that I consumed the best piece of halibut of my life at Glenn's - outclassing the same at Custom House and Blackbird. It was generous, high quality, and expertly prepared if not exactly elegant or fussed-over. Saw this fun post on Glenns from Chicago Gluttons linked to on Chicagoist. I guess the curiosity of my post above got the best of me - we found ourselves at Glenns last night for the All-You-Can-Eat King Crab leg dinner. I was surprised to find that they'd take my reservation - I remember them only taking names on a list and maybe you could call ahead and put your name on it. Last night, 7:40, table for two, no problem. Walked in the door, SRO line waiting for a table, "Hi, we have a reservation," shown right to a table. Awesome. Service was quick, to the point, very friendly and superhelpful. Two beers and two AYCE crab legs please? Coming right up. Beers poured for us, placemats lain out, bowl for crab shell with extra napkins and hand-wipes to the side. Meal is served within minutes. Two boiled redskin potatoes (good), parmesan corn on the cob (not bad), over-mayo-y cole slaw (nothing special) and crab, crab, crab (with butter and lemon). I am no crab connoisseur* but this was pretty damn good crab, to my taste. And what I loved was that there was no BS making-you-wait-around for your second and third rounds of crab. ** Even before we were done with our first huge legs, round two was on our plates. Round three followed very quickly afterwards, and we actually had to fight off more crab - the wife and I split a leg to make it round 3.5 and called it quits. A good experience and there was certainly no sign of recessionary spending at Glenn's last night. To burn off a little of our gluttony, we walked all the way back home through the Square and saw a number of mostly-empty places, notably Mythos. A couple tables were seated but it looked like a dissappointed chef sitting out front. *My only king crab leg experience came at a seafood buffet where I suspected I was not getting the full crab experience, so I've held off on judgment on how I feel about crab. **Another exercise in gluttony a couple years ago found us at the Olive Garden (yeah, I know) for the AYCE pasta bowl. They cram you full of bread and salad and soup and then took about 20 minutes in between pasta servings so your brain kicks in and tells you that you're full so you don't find yourself with room a third serving. I know they were really doing us all a favor, but still the scheme was not appreciated. How much was this crab feast? A grand total of $34. whiskeybent wrote: A grand total of $34. thats a great deal for king crab. I may have to check it out sometime. If you try it, please let us know. I hope that your experience with experimentation at Glenn's is better than mine. Just because you can bash something up and dip a fish in it doesn't mean you should. gastro gnome wrote: If you try it, please let us know. I hope that your experience with experimentation at Glenn's is better than mine. Interesting. Our trip before last to Glenn's, I had the same pretzel/walleye dish. I liked it just fine - not earthshattering, but surely just as good as any of the fresh walleye I ate during a trip to the UP during the summer. We went to Glenn's last night. They take reservations, but you have to call in a bit further ahead than I did (2 hours). They put us on the "call ahead" list, and when we got there, had a table waiting for us. Partially it was that we were 3, one of whom is in a wheelchair, so only a few of the tables would really have worked well, partially it was that they weren't totally slammed when we got there, so they were able to hold a table. Anyway, the staff were really nice, and knew who we were when we came (then again, we were the only wheelchair party of the night). Throughout the evening, service was very good. Food was tasty. We had crab cakes, mahi mahi and the pretzel-encrusted walleye. The mahi was a bit overcooked, though the fruit salsa was quite good. The crab cakes were delicious, but barely lukewarm. I enjoyed the walleye very much. 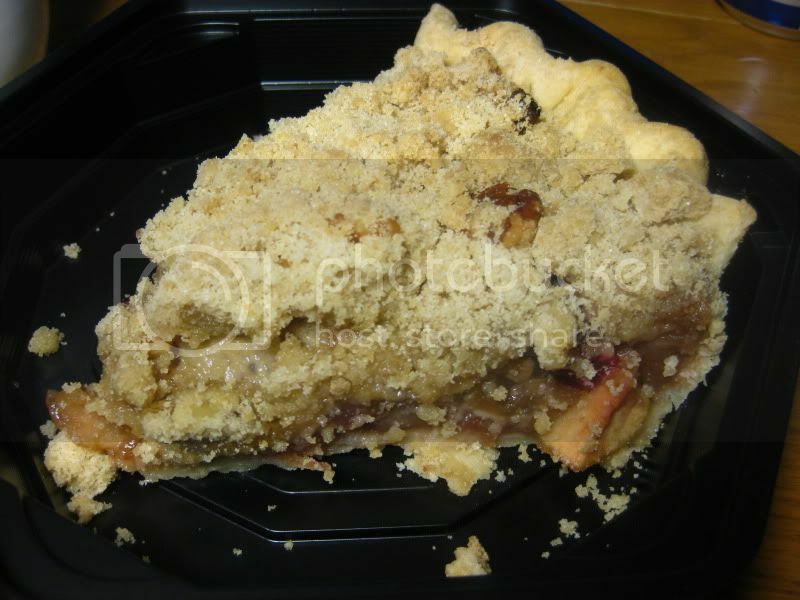 They have Hoosier Mama pies, we got a slice of pecan with ice cream (they had apple, pecan and brownie pies - other flavors are available seasonally). My mom got a "small" salad and it was pretty good-sized with a lot of tasty veggies - not just lettuce, carrot shreds and cukes like some places. She said the blue cheese dressing was very good. They have a decent selection of wine, beer, etc. We got a bottle. All glasses are $8 and a bottle is $31, IIRC the wine we ordered Burgans Albarino, retails around $14 a bottle, so not a bad deal. When I called I asked if they had candles (because it was mom's birthday), and no, they didn't. So I brought one, and sneaked it to the waitress. The manager (who I had spoken with on the phone) clearly had let everyone know, because when the pie came out, there was the lit candle. No singing waiters (thank goodness!) just a big grin from the guy who served it. I guess maybe they don't do too much of that, he clearly was tickled by it. It was pretty crowded throughout the evening. It was the Crab Legs AYCE deal and it seemed like a lot of tables were doing that. Those tables also seemed to take longer to turn. I wouldn't say it was a "special" restaurant, but it was solid all around. I'd go back. I had been to Glenn's Diner a few times for brunch and thought it was a decent neighborhood choice for breakfast/brunch, but until about a week ago, I had never been there for dinner. I'm pretty sure I'll be returning for more dinners at Glenn's as I really think this is quite the gem on the north side. First, I love the low key, relaxed vibe of the place. Service is friendly, relaxed but very efficient. For a few of us, the meal started with the clam chowder which I really liked. A couple varieties of packaged crackers placed in baskets of the table may seem boring to some, but to me it works perfectly here . . . as if to say "sit back, relax, and welcome to our home." But the real star at Glenn's is the seafood, and the choices are plentiful. My blackened red snapper lacked a real blackening, but the fish itself was so pristine that I hardly noticed the minimal blackening and the lack of blackening flavor. Pretzel crusted walleye, scallops in what I believe was a bacon cream sauce, catfish with a shrimp stuffing, and halibut with a blue cheese sauce all featured wonderfully fresh, reasonably priced and absolutely pristine quality and excellent tasting fish, all cooked perfectly. I also loved the very simple but crispy potatoes served with the entrees. $5 per bottle corkage (even though they also serve wine) and fish entrees priced under $25 (almost all of them and some priced considerably lower) make Glenn's a spot I'm surprised I haven't bothered with for dinner. That will now change. If you are one of those people for whom the phrase “New Orleans” in the title of any dish warrants a closer look, then you will probably enjoy the “New Orleans Scramble” on the weekend menu at Glenn’s. Perfectly cooked, soft scrambled eggs. Red and yellow peppers. Red and green onions. Generous portions of excellent shrimp and andouille sausage. All plated on a very tasty – and somewhat spicy – thin, red sauce and covered with a combination of wild rice and white rice. There was also a grilled potato cake that included sour cream in the mix and it all comes with toast or English Muffin. Very tasty and satisfying. At $10.95, it is also quite a bargain. And the coffee is good, too. Outdoor seating under sunny skies added to the enjoyment, but the food stands alone in making you want to wander through the rest of the menu. The weekend menu is served until 3:00 pm. going to finally hit GD for the crab legs all you can eat, tonight. My wife has been wanting to go for awhile, and we've got 4 other friends. looking forward to it. please let us know how it goes. i have been waiting to give it a try. 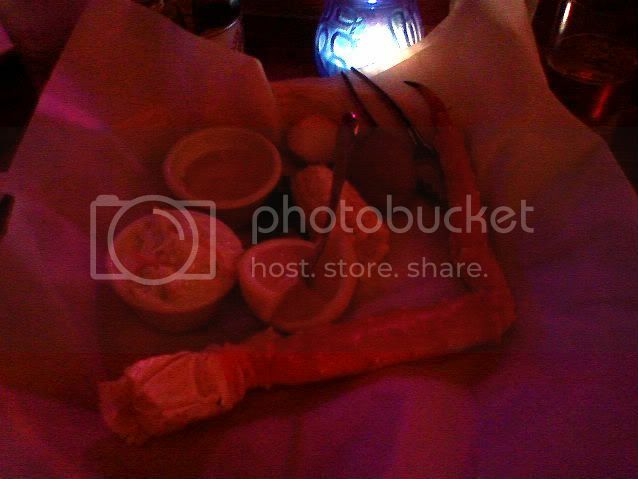 We were there a few weeks ago and my wife, who's very picky, thought the crab legs were as good as she's ever had. I wasn't very hungry so I went with fish. She and her friend had about 4 each (maybe 5). Glenn's does a solid job all around. I heard from someone this week that Glenn's on Montrose may be moving or expanding? Has anyone heard details about this? aubergine99 wrote: I heard from someone this week that Glenn's on Montrose may be moving or expanding? Has anyone heard details about this? Easiest way to find out is to call the restaurant. - Not moving, might be expanding, "we don't know yet"
Went to Glenn's Diner for the first time this evening for an early dinner. After reading so much about the Latke Walleye, I knew that was what I wanted. Imagine my surprise when the waiter told me that the dish had been off the menu for more than a year. 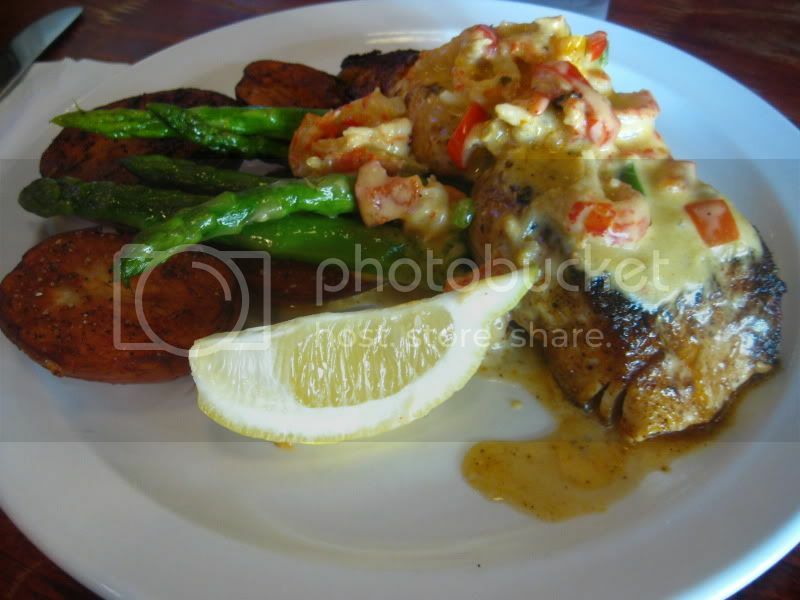 Instead, I went with Uncle Louie's Mahi-Mahi, pan fried and blackened with a "Crawfish Apaloosa" sauce on top. As everyone has said, the fish was very fresh and cooked to perfection. The crawfish sauce was nice and creamy without being too strong and the veggie sides were simple but tasty, crisp asparagus and roasted potatoes. My only minor quibble was that the sauce was a little too oily. I was very happy to see Hoosier Mama Pies on the dessert menu. I tried the Pear Apple Cranberry with Walnut Crumble and it was amazing. A huge slice, but delightfully so. I wonder if one of the richer flavors like Maple Pecan or Chocolate Brownie would have been too dense, but this fruity cornucopia was perfect for me. I went there over the weekend as well. We had the crab cakes. Nice and meaty, good texture and flavor, tasted like they sat out for a bit before being served to us. I had the arctic char and my gf the catfish as they were out of a couple dishes she would have preferred. I think the fish was well cooked all around but the sauce for the char was a very underwhelming and the seasoning on the catfish was very lacking. I feel like this place has sort of gone to tween land. In between a local diner and a place worthy of a special trip. I don't think it is good enough to put in the amount of effort it takes to go there. You have to have reservations, made a day or two beforehand if you want a prime time, I had also tried to walk in twice before w/o luck, and the place is a bit claustrophobic feeling to me. And the food is solid but not spectacular or worth dealing with it all. if this was still a local diner you could walk in to and get a quality cooked piece of fish it would be worth it but, it has outgrown that. After reading today's comments on Sweets and Savories (especially John Danza's comment of July 10 ), which suggest Glenn's Diner as an alternative to S&S, I decided to do this review based on my visit a few weeks ago. I stopped in right after 5:00 on a very warm day, right after a visit to Half Acre Brewery (oh, lord, do I love their Daisy Cutter pale ale!). I had skipped lunch, and my wife was also ready to eat. We were struck by the eclectic look and feel of the restaurant - and remembered that we had seen it on Check Please several years ago. We also remembered that the seafood was supposed to be fresh, and we were impressed by the number of different offerings available. I was even more impressed as they posted the unavailability of certain dishes as the meal progressed. Nice to know that they aren't overbuying and holding fish. First, the praise. My wife was very impressed how well the waitstaff handled moving tables around to handle access for her power wheelchair. Many better restaurants have fumbled this small piece of hospitality (see my review of Topolobampo, for an example), these folks handled it with aplomb. The PEI mussels, which were alleged to be an appetizer, were excellent, and certainly enough for a main course, especially supplemented with a North Coast Scrimshaw pilsner. They were fresh plump mussels, steamed in an outstanding white wine and herb broth - as good as we've ever tasted. As for me - the meal had both pluses and minuses. I ordered their Cioppino. I was impressed by the heat of the fish broth, thanks to a generous spray of red pepper flakes, and the diversity of the seafood used. I think this dish is almost ecological, as it appeared that the kitchen used trimmings from walleye, arctic char, and sturgeon filets to add to the stew, along with fresh mussels, clams, and an abundance of shrimp. I approve - this is NOT a criticism, but rather an appreciation for efficient use of resources. Portion size was also great - which worked out because I was hungry. The large plate of perfect toast points was ideal to soak up the broth - yum. But there was one huge drawback. Salt. Loads and loads of salt. I'm a transplanted New Englander, and I know that some fresh seafood brings salt with it, but this dish was excessive in the amount of salt added to the fish broth. Did it stop me from enjoying the meal? No. But it did contribute to the three glasses of iced tea I had to consume while I was dining? Oh yeah! This dish would have been a huge success, but for the oversalting. So I think I'll be returning to Glenn's Diner, but next time, I may opt for something a bit less heavily seasoned from the kitchen. One other thought. This is not a restaurant with diner prices, at least for the seafood. Entrees were all north of the $20.00 price point, and many were a la carte. So don't expect to visit a Diner and get a seafood dinner for $12.00. rfleisch1 wrote: But there was one huge drawback. Salt. Loads and loads of salt. I'm a transplanted New Englander, and I know that some fresh seafood brings salt with it, but this dish was excessive in the amount of salt added to the fish broth. Did it stop me from enjoying the meal? No. But it did contribute to the three glasses of iced tea I had to consume while I was dining? Oh yeah! This dish would have been a huge success, but for the oversalting. If there's one thing I can take away from reading posts here (and elsewhere) over the years is that no two people taste salt in the same way. My wife is a chronic salter - she salts anything she eats before tasting whereas I tend to be more judicious in my salt use. However, I've read scores of posts where saltiness was a complaint for others but not true in my experience. I can't speak to the cioppino at Glenn's but I've eaten there numerous times and have never found any dish to be overly salty. rfleisch1 wrote: After reading today's comments on Sweets and Savories (especially John Danza's comment of July 10 ), which suggest Glenn's Diner as an alternative to S&S, I decided to do this review based on my visit a few weeks ago. Holy cow! This is the first time someone actually paid attention to something I said. I've not encountered this in the dishes I've had there, and I've grown to be pretty sensitive to salt over the past year or two. However, all dishes are different, so perhaps the ones I've ordered were less seasoned than yours. rfleisch1 wrote: One other thought. This is not a restaurant with diner prices, at least for the seafood. Entrees were all north of the $20.00 price point, and many were a la carte. So don't expect to visit a Diner and get a seafood dinner for $12.00. True, the prices are not "diner" cheap. But I think the beauty of this place is that they have high quality seafood dishes and they're essentially BYOB for next to nothing. The glasses are non-existent, so you have to bring those too. But when I want to open a really nice white or champagne from my cellar, I think it's a good place to do it. I love the scallops in bacon cream sauce. Its lightly sauced but adds a nice flavor. I like a sauce with my fish as long as its not swimming in it. The crab roll sandwich has been good too. Anyone been here recently? I wonder what they've been offering lately. I'm planning on a visit Friday. Try the Meat Loaf... very good ! ! and the BBQ Ribs are also a good choice. Recently, I've had their brunch, which involved smoked trout hash-delicious. Good mimosas, too. My friends split an order of Eggs Benedict and were stuffed. I know it's not the main thing, but the portions are generous. Too generous for us to have pie. All you can eat king crab legs here are godlike. Last time I was there I ate about 8 of them and loved each and every one. If you have the ability to eat massive amounts of food, it is worth the steep entry fee. heading over tonight to satiate my wife who is due with our kid on Friday. All you can eat crab legs! Little pricey right now though - they told us market is $52. Yikes. Chitown B wrote: heading over tonight to satiate my wife who is due with our kid on Friday. All you can eat crab legs! Little pricey right now though - they told us market is $52. Yikes. Wow, you have to pound a bunch of them for $52. I hope she doesn't get carpal tunnel working the shells. dang, a little pricey like you said, but not ridiculous imho. 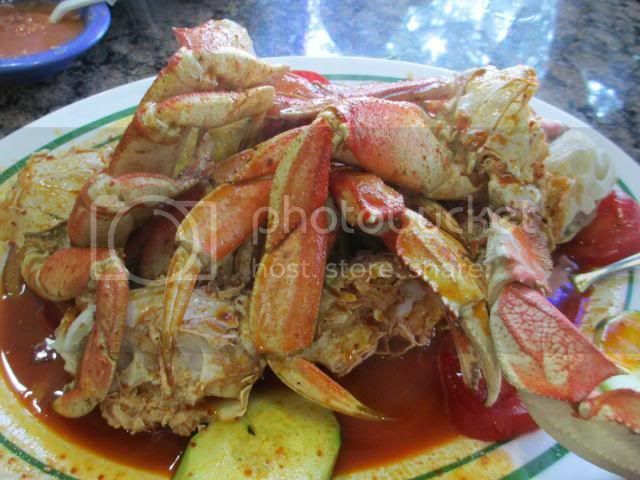 My favorite crab feast around @ Mariscos El Veneno, 3 nice crabs come in at $40..